Police lead Cr Davies and his children home this morning. Picture: Jon Bassett. 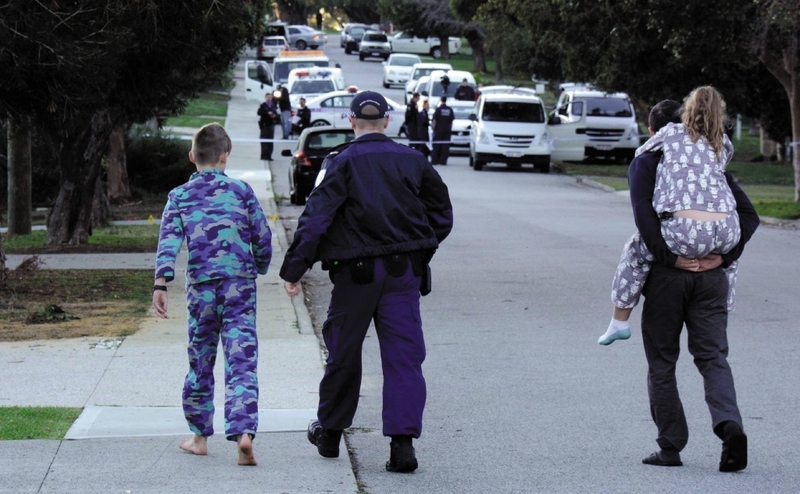 MOSMAN Park councillor Wesley Davies has told how he and his children were ordered to evacuate their home after a hostage-taking gunman (26) was shot by police next door from their Samson Street, Mosman Park house about 10pm last night. “I was woken up with shouting ‘Put the gun down, Put the gun down’,” Cr Davies said. After last night’s council meeting, he was trying to sleep when he heard screaming from a girl next door. “This happened right next door to my bedroom, which is at the front of my house,” he said. He locked his doors while his children (10) and (12) slept, but his partner’s barking dog prompted him to go outside, where he found armed police shouting for him to get back in the house. After hearing two shots, police knocked to Cr Davies’ door. “The guy said we’ve had a hostage situation next door, and we’ve all got to get out,” he said. He, his children and many other residents of the street spent the night with neighbours and relatives. Residents said they saw people bound with tape coming form the rented house, whose residents were an Asian couple and a Swedish man aged in his 20s. Inspector Rob Harrison said a man was in a serious condition after treatment for a gunshot wound at Sir Charles Gairdner Hospital, and five other people in the house last night were assisting detectives with their inquiries. He would not speculate on why hostages were taken, their relationship to the gunman, or whether there was more than one hostage taker. Police ruled out initial fears there may have been a bomb in the house, and any link from the hostage drama to a police operation involving mounted officers to combat theft from cars in Mosman Park yesterday.